Barium Chromate is an oxidizing agent. The oxidation state of the Chromium in this compound is +6. The Barium ions in the compound produce green flames when heated. 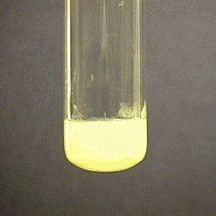 This reaction produces BaCrO4 precipitation which is then collected by filtration. Sodium Chloride is also produced (NaCl) in this reaction. The formula for this compound is BaCrO4. Appearance: It is a fine light-yellow powder. Odor: This compound is odorless. Solubility: Barium Chromate is insoluble in water but soluble in acids. Melting Point: This compound decomposes at 210 °C. Density: Its density is 4.498 g /cm3. This oxidizing agent is used for many industrial purposes. 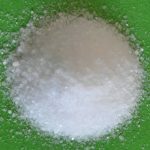 It is widely used as an oxidizer as well as a burn rate modifier in many pyrotechnic compositions (a substance that produces an effect by light, sound, heat, gas and smoke as a result of self sustaining exothermic reactions), especially delay compositions. This compound is used as a pigment in ceramics, paints, fuses, porcelains and coloring glasses. It is also used for preventing corrosion (as corrosion inhibitor) between dissimilar metals. Barium Chromate is used in safety matches. It is useful in various ignition control devices. This compound is used in metal primers. This substance is used in explosives as an initiator of explosions. Barium Chromate can have hazardous health effects in case of over exposures. It can cause damage to many human organs including kidney, lungs, blood, nervous system, liver and mucus membrane. One should take certain precautions while handling this substance. This compound can cause serious health hazard in case of inhalation and ingestion while eye and skin contact will result in irritation. Inhaling this material causes breathing difficulty. Severe over exposure can even result in death. Ingestion: It is not advisable to induce vomiting in case of accidental ingestion of this material. Tight clothing should be removed. One should never give anything by mouth if the victim is unconscious. It is important to obtain medical aid as soon as possible as serious ingestion can even cause death of the victim. Skin Contact: Victim should wash the contaminated area with a disinfectant soap and plenty of water at once. It is also advisable to apply some anti-bacterial cream to the affected skin. The infected clothes and shoes should be removed and washed properly before re-use. One should obtain medical attention immediately. Eye Contact: In case of direct eye contact, one should remove any contact lenses and flush the eyes with plenty of lukewarm water at least for 15 minutes. It is important to get immediate medical assistance. Barium Chromate is non-flammable; however, fire fighters should use proper fire fighting gear and protective clothing in order to avoid any direct contact with this compound when extinguishing a fire around it. It should be stored in tightly sealed containers in a well ventilated place away from heat as well as any acids, alkalis, combustibles and reducing agents. There are many companies who supply this oxidizing agent worldwide. It is also available for online buyers at reasonable prices. Barium Chromate is widely used in various industries for different purposes. It is quite simple to produce this compound which makes it one of the most useful oxidizing agents for many chemical reactions.